Picture books speak to children in both words and images. A Sick Day for Amos McGee stands out in the world of children's books because of its endearing tale and its equally endearing pictures. There is little wonder that this book won the 2011 Caldecott Medal. 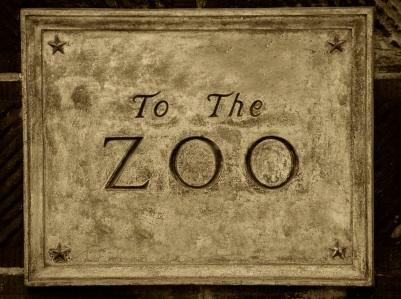 Amos McGee is an elderly zookeeper who finds himself too ill to visit the animals at the zoo. Mr. McGee's animal companions decide to travel to his home to comfort him through his sick day. The surprise guests take the bus to see their loving friend. The beauty of their trip is that it mimics the very routine that Amos follows each day to see his dear animals at the zoo. The story is charming in its simplicity, but there are many levels to A Sick Day for Amos McGee. The underlying message is one that appeals to a child who is drawn to nurture others as he has been nurtured. The animals reciprocate caring in the same loving way as Amos demonstrates. Pair the current of reciprocal caring with softly constructed images that capture the pace of the story, and you have a timeless tale. The moving force behind the award winning story is the husband and wife team who created the children's book. Philip C. Stead is an author and illustrator who collaborated with his artist wife, Erin Stead, to create A Sick Day for Amos McGee. The couple toggle between Ann Arbor, Michigan and New York City. Philip wrote the story with his wife as the illustrator in mind. Amos McGee is Erin's debut as a children's book illustrator. Telling a tale in a picture book well involves knowing when to use words and when to allow the images to speak for themselves. The story is well paced, quietly introducing Amos as an early riser who follows a path to visit his animal friends every day. The pattern repeats through the actions of the animals as they reciprocate his kindness while he has a cold. Erin creates each image by hand using pencil and a woodblock printing process. The printing technique is a form of xylography, which is an ancient method. The result is modern images that have a sense of antiquity. Learning comes in many forms. A book like A Sick Day for Amos McGee provides many opportunities to develop educational and guided reading activities that work on artistic and literary skills. Brimful Curiosities has a wonderful woodblock printing project that is inspired by Erin Stead's work. Kids' Wings has an activity guide for the book that parents can download for a fee. Activities include math, discussion cards, comprehension questions and riddles. Teachers Pay Teachers is a marketplace for educators that features a literature guide for the book. The guide includes writing, comprehension and animal research pages. They say an elephant never forgets. Why do you think the elephant likes to play chess? The word rhinoceros comes from rhino, meaning nose. Is this something the writer might have thought about? Amos imitates the way the penguin points his toes inward. How does the penguin pay him back later? Why does Amos race the tortoise? Can you think of another story that has a tortoise in a race? Why did the author choose to have Amos read bedtime stories to an owl? Parents can keep kids interested in books by selecting titles with similar appeal. Books that have earned the Caldecott Award have a unique distinction. A Sick Day for Amos McGee has great appeal because of its unusual artistry that manages to evoke a feeling of antiquity. Young readers will fall in love with the quiet nature of the book, and the tale may inspire them to offer others comfort.